In 1878, Bulgaria was divided into two parts—the Principality of Bulgaria whose capital was Sofia, and the vassal province of Eastern Rumelia, whose capital is still the region’s centre, Plovdiv City. 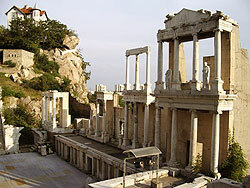 Plovdiv has monuments of cultural and archeological importance, and Thracian and Roman settlements are found in the area. There are numerous monasteries in the Rhodopes and along the foothills of the Balkan Mountains are popular stops in religious tourism. The spectacular beauty of the Raysko Praskalo (the Balkan Peninsula’s highest waterfall), the Central Balkan National Park, and the presence of rivers and numerous healing mineral springs have also been a boon to Plovdiv’s economy. 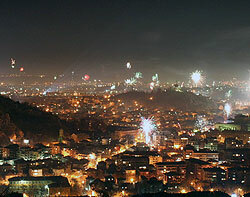 Plovdiv’s industries include iron metallurgy, electronics, machinery, food production, and wine production. Sitting between the banks of the calm Maritza River, Plovdiv City is Bulgaria’s second largest city. Despite its size, the city is quite scenic and pretty. It was built on seven rocky hills (or tepeta, in local parlance), which lend character to a city rich in natural and cultural charms. Founded contemporaneously with Homer's Troy, Plovdiv has over 200 archaeological sites. Treasures from antiquity survive in the form of a Roman stadium, the Antique Amphitheatre, some Ottoman baths and mosques, and medieval towers. Less old but quite as charming are the Old Quarter's narrow streets, lined with houses and churches built in the National Revival style in the mid-to-late 1800s. Plovdiv has many art galleries and museums. Its Ethnographic Museum, housed in a lovely Baroque building dating from 1847, is also fascinating. The Old Town, built on three of the hills, has sprouted a number of chic cafés, restaurants, craft workshops, and souvenir shops to cater to the growing number of tourists; the area is now rather unflatteringly known as “The Trap” by the locals. Office space is in high demand, and the district of Trakiya is being developed into a commercial and industrial park. Trade centres have been built around Trakiya and the Central district, along with several shopping malls and hotel complexes. Plovdiv’s biggest district is full of blocks of flats to accommodate its large population. Trakiya’s commercial area, which has several markets and some shopping centres (and more to go up soon), gets a lot of customers: locals, the students of the Agrarian University of Plovdiv at one end of the district, the workers from Plovdiv’s industrial zone at the other end, and people coming from Trakiya’s railway station next to the industrial sector. Trakiya has some green areas, notably a botanic garden and Lauta Park. The park has sports facilities, including a football stadium. A new water park was built here in 2006. Plovdiv’s Central District rewards walkers. There is a wide pedestrian bridge across the Maritsa River lined with stalls that sell food, clothing and other items. The pedestrian bridge leads to the city park, the central square and the district’s shopping areas and offices. You can also reach many interesting sights on foot, such as the city’s ancient Roman ruins: a stadium, an amphitheatre, a watchtower atop Sahat Hill. From the hill one can see the stately white tower of the Djumaya Mosque, one of the many centres of Islamic worship that were built in Plovdiv over the centuries. Many of these mosques are now museums. The Central District has has some modern attractions too. There are quite a few trade exhibition halls, including the Grand Trade Center, the Business Centre Rilon and the International Fair Plovdiv. The modern, sprawling fairground is one of the largest exhibition areas in Europe. Inside the Tsar Simeonova Garden is one of the Central District’s attractions: the Singing Fountain, a large pool whose displays of water sprays and lights are synchronized with music. One of the Central District’s neighbourhoods is Marasha. It is close to many of the city’s attractions and facilities—a well-stocked supermarket nearby, the sports stadium and a gym just minutes away, a picturesque park not far from the residential area. Marasha is also a very accessible area, being close to the train station and the highway. Buses go through the neighbourhood too. Situated downhill and right next to Plovdiv’s Old Town, the Central District neighbourhood of Kapana is a busy, popular place, with a concentration of restaurants, bars, cafés and stores. Kapana’s name means “The Trap”, which might refer to the chaos of narrow streets that make up the quarter, with the small one- and two-storey establishments crowded along each of them. It might also refer to the fact that its many stores can lure tourists to spend on trinkets and souvenirs of their stay.